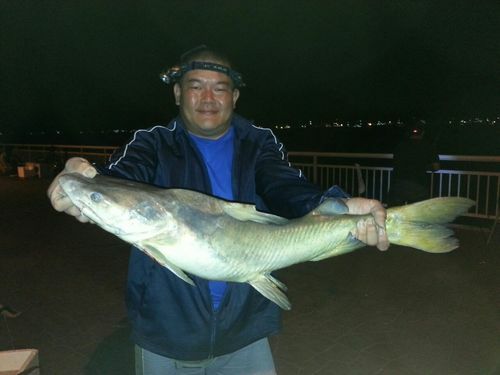 Ah An caught this Yellow tail catfish or Mayon early this morning when the tide was mid way up. The fish pull his line when the current was fast. I strike it for him before passing the rod back to him to fight. As we got other rods to wind back, I ask him to play it slowly until I get my gaff ready. I gaff it and it weigh around 5kg. Earlier he also landed a conger eel around a kg plus. Using the same bait which was still intact, he casted out again and it attracted this catfish. So it is one squid bait two fishes landed.